Release the hood latch from inside the car near the driver’s seat. The Fix-It Club can help you maintain your car better by showing you how to perform easy car maintenance while you’re waiting for the gas pump to fill your fuel tank. Maybe you’ll decide to hire someone else to change the car’s oil and tackle other tasks, but if you can get into the habit of checking it every time you fill it up, your car can live longer — and make your life a little easier. This Fix-It Guide walks you through the car maintenance things you can easily do at the gas station and show you how to pump fuel the easy way, check tires and wheels, check under the hood, and how to calculate miles-per-gallon (MPG). That’s gas pump maintenance. You can pump your own fuel in nearly all states. And in the two where you can’t (Oregon and Vermont), you can get out of the car and perform these simple car care steps without getting arrested. 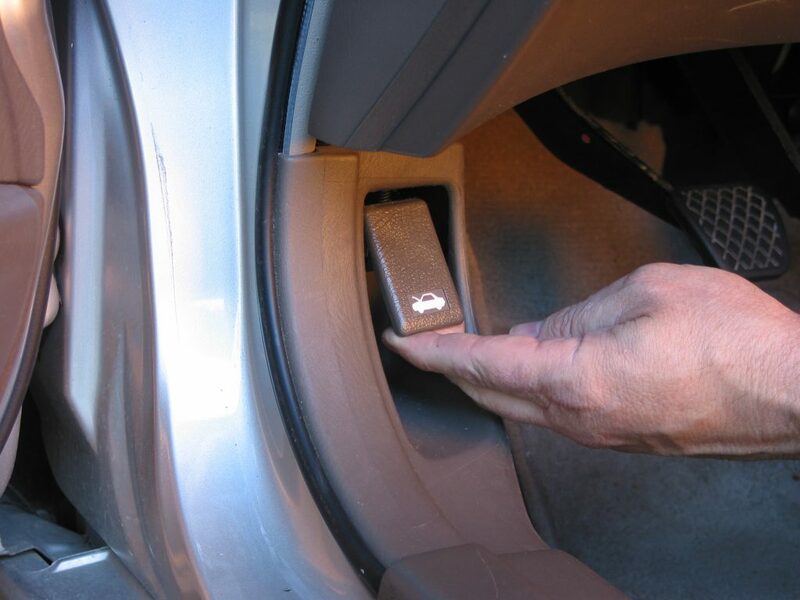 Before you step out of your car, pull on the hood release handle. It’s probably on or near the floor on the left side of the driver. You’ll later unlatch the hood as part of your quick inspection. The first task is to make sure that you’re getting the correct fuel for your car. The car’s owner’s manual (probably in the car’s glove compartment) will tell you what the engine is designed to use. For example, “Unleaded gasoline, pump octane number 86 or higher.” That means the gasoline pump will have a yellow sticker with “86” on it. You can use higher-octane fuel, such as 89 or 92 octane, but you won’t be getting any benefits from the extra cost. The owner’s manual also notes the fuel tank capacity. You can make sure the fuel gauge is working by guesstimating how much fuel your tank will take to fill it. For example, a 17.2-US-gallon that’s on the one-quarter mark will take about 12 gallons to fill it. (Empty isn’t really empty; it still has 1-2 gallons of fuel in most cars.) So if your car takes significantly more or less fuel than your guesstimate to fill it, the fuel gauge may not be functioning accurately. Octane number is a measurement indicating the tendency of gasoline to detonate (combust at the correct moment) or knock (combust before or after it should). Diesel engines use a cetane number or rating. An engine’s designer selects the required octane or cetane number based on the engine’s compression ratio. Be lazy! Most gas pump nozzles have a mechanism in the handle to let you fill the tank automatically, freeing you to do other things – like checking over your car. Once you’ve squeezed the nozzle trigger to begin fueling, look for a small latch below the trigger and swing it down until it catches in a groove on the handle. Back pressure from a filled tank will automatically release the latch so fuel stops flowing at the right time. Handy, huh? Once fueling begins, walk slowly from fuel filler toward the front of the car, looking at tires. Later I’m going to recommend that you buy a tire pressure gauge or periodically visit a tire store as most will check tire pressure for you at no charge. Once you’ve done that you’ll know what the tires should look like. Unless you’re having problems with your tires, a quick look at each tire for inflation every time you fill up is all you’ll need. Look over the tires for damage as well. You also can take a tip from truck drivers who typically check tires every time they fuel up. As they walk around their rigs they strike the tread of each tire once or twice and listen. Experience quickly teaches them — as it will teach you — what a properly inflated tire sounds like. Driving can be cramping to the body, so consider taking an extra moment to squat down and look under the wheels for anything hanging or leaking. The exercise can be good for you — and your car. The second hood latch is located at the middle-front of the hood. Release it by lifting up on the right side. You previously pulled the hood release handle inside your car before stepping out. Now you are at the front (or rear) of the car and can unlatch the hood for a quick inspection of the engine compartment. If you’ve never tried this before, the latch is a lever under the center of the hood that you push or pull. Its job is to make sure that your car’s hood doesn’t pop open while you’re driving — not fun! Some car hoods have hydraulic cylinders or large springs at the back corners to hold the hood up while you’re peering inside. Many have a support rod that will hold the hood in place. The rod will be laying down somewhere around the perimeter of the engine compartment. One end will be attached to the car and the other can be lifted and inserted in a specially designed hole in the hood’s edge. If you’re not sure where the rod is located on your car, check the owner’s manual. What’s in a name? In the United States, the engine compartment cover is called a hood. In Britain it’s called a bonnet. Two countries, separated by a common language! Now what? There are a number of quick visual checks you can make. Once you’ve learned more about your car you’ll know where things are and specifically what problems to look for. For example, you may notice that the battery looks gunky, suggesting that the terminals should be cleaned so it doesn’t lose power. Or you see that there is a lot of oil sitting on top of the engine and figure out that the oil cap is not on tightly. You’ll also visually check the fluids. Many modern cars have a coolant overflow tank near the radiator, and some of these tanks have a “full” mark on the side. If low, plan to refill it once you get home where you have tools and supplies. The engine oil level should be between the two marks on the dip stick. See the car’s manual for specifics. 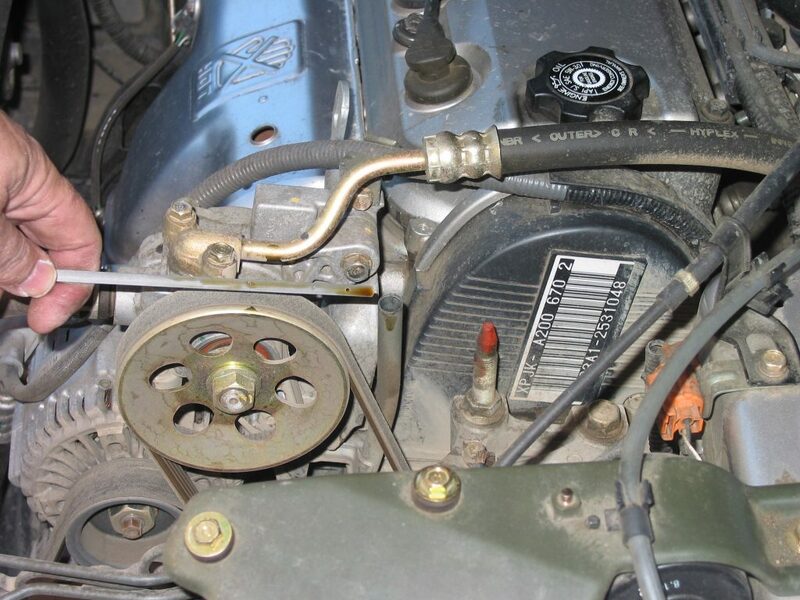 You quickly can check the level and condition of the engine oil. Find the oil stick and pull it toward you. (If unsure of its location, check your car’s owner’s manual or ask a mechanic or experienced car owner to point it out.) Visually check the oil level. It should be at or slightly below the “full” line on the end of the stick. Also check the color and condition. Brown is good. Black is not so good. Water in the oil is very bad. Also visually inspect the windshield wiper tank to make sure it has fluid. You don’t need to refill it now, but make a mental note to fill it when you get home. As you learn more about your car you will make more extensive visual checks under the hood of your car. You can make sure battery terminals are tight, make sure spark plug wires are securely connected to the plugs, and other checks. Most vehicles look about the same when you take their clothes (bodies) off. Many early SUVs, for example, were built on frames and running gear (engine, transmission, differential) used for pickup trucks. RVs, too, are built on truck chassis. Not all oil dipsticks say “full” and “add.” Some abbreviate levels as F and A or just have two dots with the one closer to the stick handle as the “full” mark. On most cars, the “add” mark indicates the oil level is one quart low. Check your car’s owner’s manual for specifics. Once done inspecting under the hood, continue your walk around the car looking at tires and wheels until you arrive back at the fuel filler. Once the gas pump shuts off, carefully replace the hose, pay for the fuel, and get a receipt. Your fuel receipt should show you not only the total cost, but also the price per gallon and, very important, the number of gallons of fuel required to fill it. Or, put another way, the number of gallons of fuel used since you last filled the tank. In the future you will zero your car’s trip odometer so you know how many miles were driven on this tank of gas. All cars have a total mileage odometer below the speedometer. Many have a trip odometer that you can push or twist to return it to zero. Otherwise, you can write the mileage at fill on each of your receipts and do the math later. Why is MPG so important? Other than bragging rights, the MPG figure can tell you how well your car is running. If you write these numbers down in your Car Journal you’ll soon have enough of them to see trends. A gradual or sudden change in MPG can be telling you there are problems with your car. If your driving habits or type of driving (highway, city, country) are about the same, changing MPG can mean the fuel injection or carburetion system isn’t working as efficiently. Or it can indicate a deeper problem. The earlier you know that something is amiss, the earlier you can take care of it. That’s about it. Checking out your car as you fill it up can help you identify abnormal conditions before they become problems. And the more times you perform these simple checks the easier it will become to figure out what’s normal and what’s not. Even if you decide you never want to change oil or perform other basic maintenance, performing these quick and easy tasks will help you keep your car on the road longer at lower cost.